We are a team of SEO Experts, based in Chicago and Schaumburg, IL. We understand each business or industry is unique. Proceed Innovative’s experienced SEO team creates customized integrated internet marketing solutions for your business that will help you accomplish your objectives and meet your ROI goals. We have a proven track record of success and experience to match your Internet marketing objectives and budget. Jasmine Panayotov is involved in all facets of the company’s business, including sales, marketing, financial planning, strategic alliances, international relations and technical operations. Mrs. Panayotov utilizes her project management skills to lead Proceed Innovative team efforts to develop search engine marketing programs for various types of business. Her vast technical and Internet business knowledge allows her to work with clients and translate business requirements into SEM project specifications. She has more than twenty years of experience in IT and marketing and more than eleven years in the search engine marketing arena. Mrs. Panayotov’s educational background spans two continents and includes a Master’s Degree in Electronics and Microelectronics from the Technical University in Sofia, Bulgaria. Upon coming to the United States, she graduated from Loyola University in Chicago with a Master’s Degree in Computer Science. Luke Moreno has been working with Proceed Innovative since 2009. Previously he worked as the lead sales representative for a multi-billion dollar company pertaining to the printing industry. He currently manages business development for Proceed Innovative and specializes in custom website development, search engine optimization (SEO) services, and lead generation services for franchisees and independent businesses. Mr. Moreno works with many independent ServiceMaster businesses and helps their owners and marketing executives build an effective online marketing strategy for their organization. He is able to combine his knowledge of internet marketing along with his understanding of the goals and operations of ServiceMaster businesses to help them achieve sustainable growth through effective digital marketing strategies that include lead generation, search engine optimization, and custom web development. Luke has helped numerous ServiceMaster clients experience significant results from these strategies. Mr. Moreno is a member of the Schaumburg Business Association as well as the Carol Stream Chamber of Commerce. He currently resides in Aurora, IL. Patrick Panayotov is focused on expanding business opportunities for clients and constantly improving the results from their marketing campaigns. 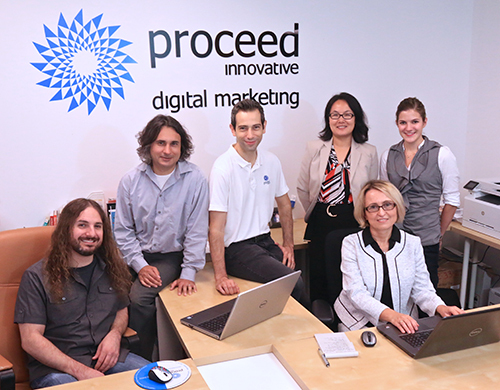 Beginning his career with Proceed Innovative in 2011, as a Data Analyst, Patrick learned the fundamentals of what drives a successful digital marketing campaign. Drawing from that experience in his current role, Patrick works closely with clients to bridge the gap between the technical improvements that are implemented and the tangible results which they bring. In addition to translating the complex language of digital marketing, Patrick helps clients upgrade their online presence with a new website. He works diligently to understand the client and their target customer to produce the best possible results. Patrick graduated from the University of Illinois at Urbana–Champaign with a Dual Degree in Finance and Marketing.